Most famous in the countrysides and seasides of Greece, Italy, and France, Mediterranean landscape design has influenced landscapists all over the world. 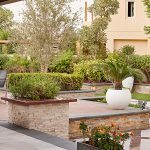 With their soft colors, brightly patterned tiles, clipped hedges, and gravel paths – it’s an inspiration to design The informal and drought-tolerant plants make Mediterranean landscape design the perfect option for your UAE landscape. 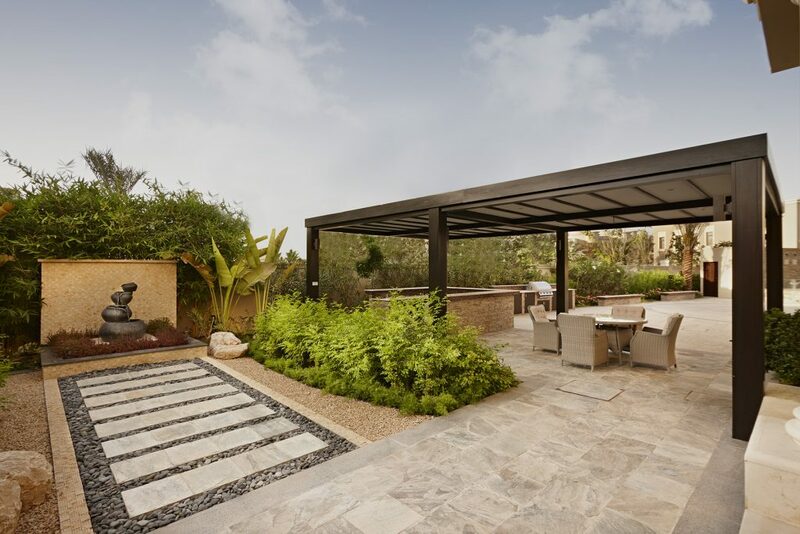 Aesthetically pleasing to the eye, generally low maintenance, and water-wise, you can easily achieve a Mediterranean landscape design with a little help from the experts at Milestone. A key component to achieving an authentic Mediterranean landscape design is establishing defined seating areas. 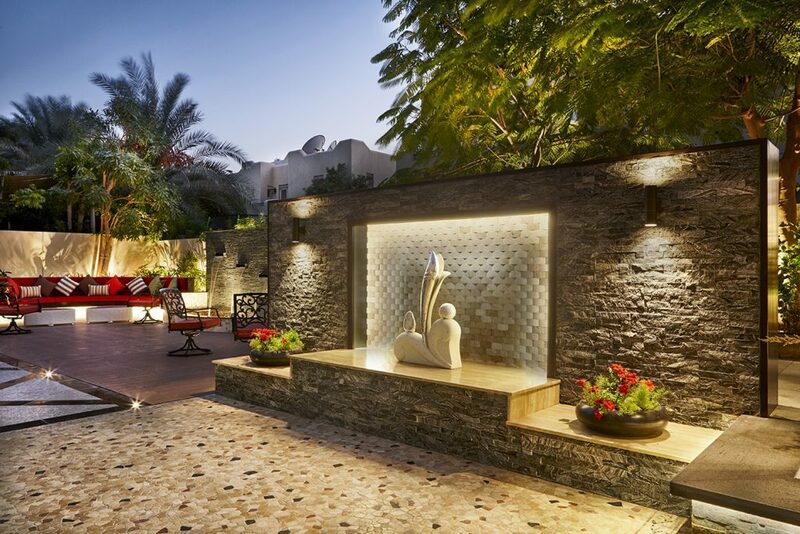 The UAE climate is so hot that outdoor seating areas are a must! Shaded seating areas provide a place to unwind from the heat of the treacherous sun. They offer a relaxing place to enjoy a cup of tea early morning or a place to enjoy the sounds of the night once the sun sets. However, the key to outside seating is shade. Milestone Project – Backyard design & transformation. Pergolas provide the perfect shade structure to ensure your seating area is protected from the direct sunlight. 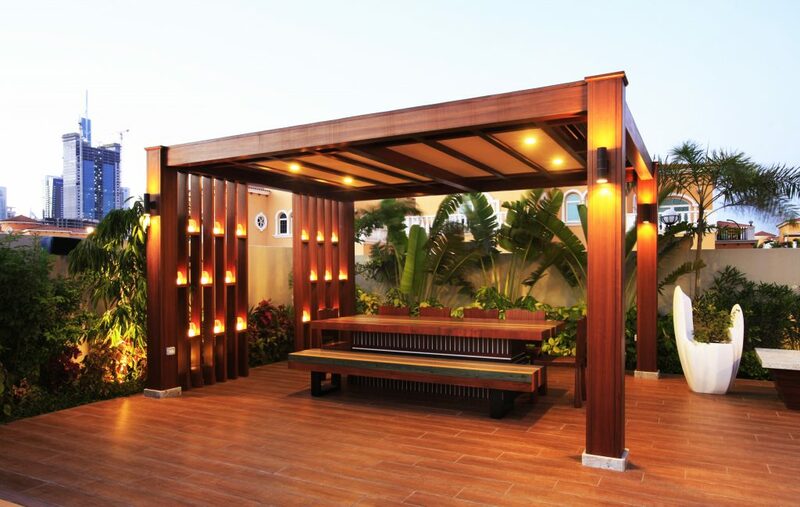 Additionally, pergolas provide a lovely decorative accent for your backyard. 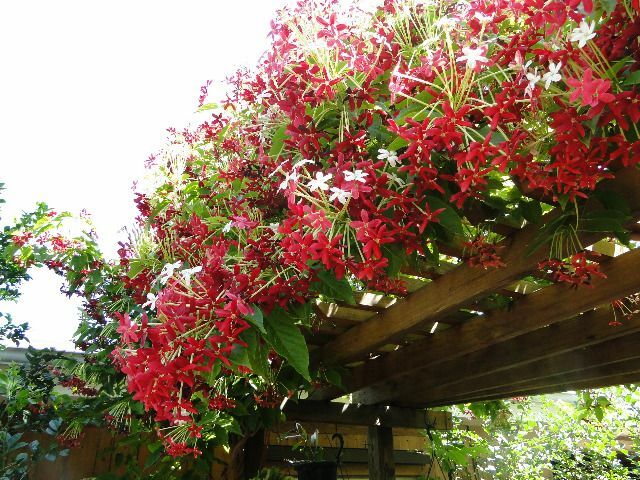 You can accent your pergola with climbing plants. For example, Jasmine or Rangoon Creeper (Quisqualis Indica) is a drought-resistant plant, which blooms with perfumed flowers in the spring. There are few better ways to celebrate the Mediterranean culture than by dining al fresco with family and friends. Your shaded area is also the perfect place to establish an outdoor dining area. 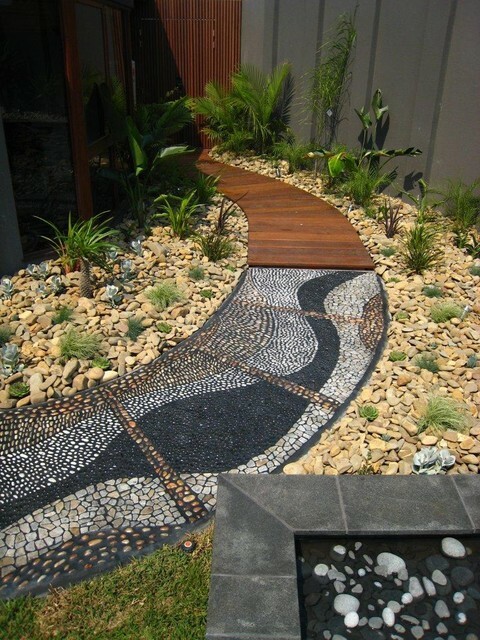 Another key element associated with Mediterranean landscape design is gravel pathways and flooring. In Mediterranean areas, property owners have long grappled with too little water for their plants. As such, they have replaced green with more drought-friendly options. 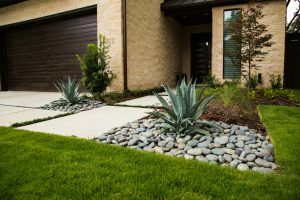 Mediterranean landscape design often replaces grass with paving, stone slabs, gravel, pebbles, cobblestones, or a combination of these natural elements. The creative experts at Milestone can weave cobblestones and pebbles into intricate designs. Pebble mosaics were the earliest types of mosaic in all areas of the Eastern Mediterranean. These stunning designs have a rich history that dates back to ancient times. Not only do these stone accents look fantastic, but it also significantly reduces the need for water. Additionally, gravel and other stone elements are low maintenance and long-lasting. Are you considering an ornamental pond, custom fountain, water wall, or full-scale pool? 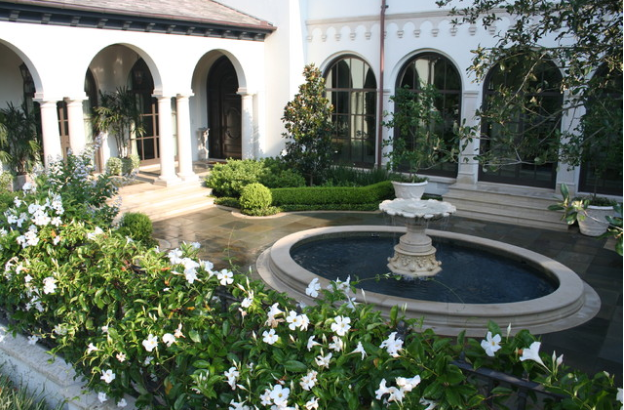 Water features are a must in Mediterranean landscape design to cool the hot summer air. The soothing sounds and gleam of rushing water add a delightful element to any backyard. Regardless of which water feature you choose, the sounds and sights of water provide an enjoyable relief on hot summer days. 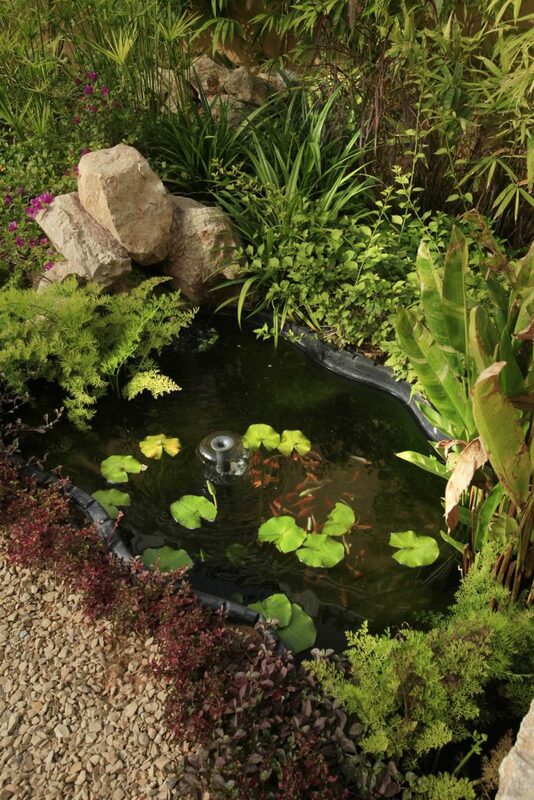 Moreover, the birds and butterflies will enjoy your water features too! One of the great appeals to a Mediterranean landscape design within the Middle East lies in the beautiful drought-resistant plants. From attractive succulents and flowering plants, you simply can’t go wrong with the stunning appeal of Mediterranean inspired plants. Think agaves with their beauty. Jasmine plants with their serene white fragrant scented flowers. Or, yucca plants with their large leaves and creamy white flowers. Clipped hedges are not only pleasing to the eye, but they also add to your garden’s architectural framework. Tecoma stans, Nerium Oleander, Murraya Paniculata, Thevetia are some of the more common hedges used on Mediterranean landscape design. Very versatile, this evergreen offers height and an element of dramatic flair to your garden. 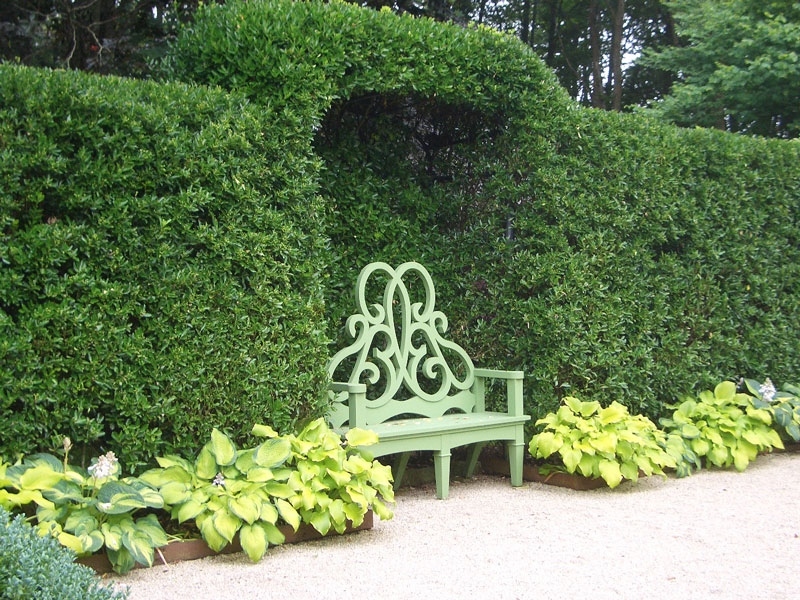 Additionally, hedges can be added to your garden. These drought-resistant plants offer a year-round element of greenery that also doubles as a privacy fence. Because of the ideal climate, the people of the Mediterranean lead an outdoor lifestyle. For hundreds of years, they have been gardening, socializing, and dining outdoors. If you are looking to add an element of the Mediterranean to your backyard, you’ve come to the right place. Contact a member of our team for your landscape design consultation today! We look forward to bringing your vision to life.